This page has views and emails used by the administrator. Note some of the views may not be visible to you, depending on your privilege setting. A client can either be an event race director or a signature race sponsor. 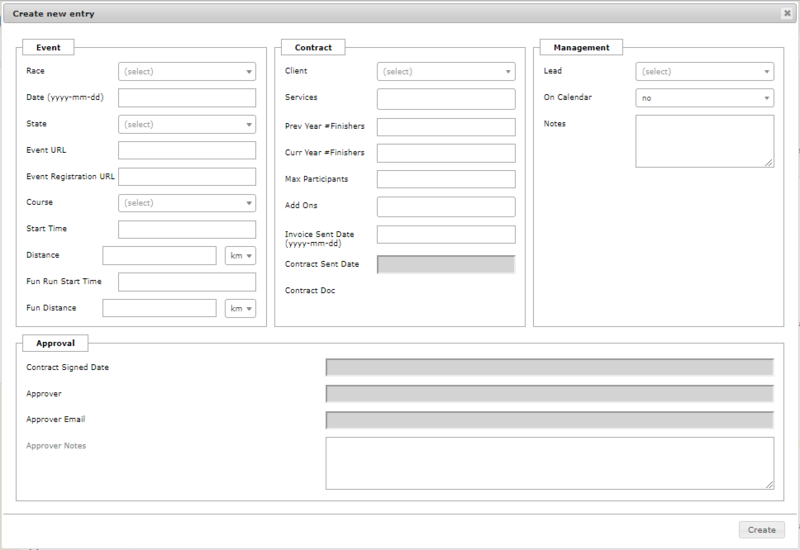 The main administrative interface is a calendar of the events in the database. The administrator can create a new event, or select an event for Edit, or Delete operations. To create a new event, click on a date. To edit an event, click on the event. The colors for the days and events help the administrator understand the state of the event, whether finish line services are required, or if this event just has premium promotion service. 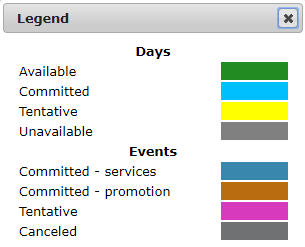 While the Admin Calendar view may be the easiest way to view all the events, this view provides a table of all the events in the database which can be used as well. 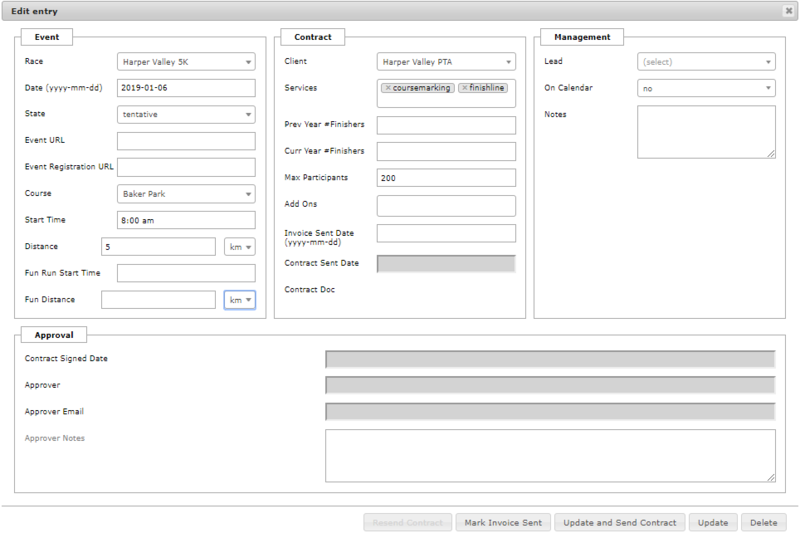 The admin can create a new event, or select an event for Edit, Notes, or Delete operations. Notice the State column. The State may be updated automatically by the tool or the admin can update it through the administrative interface. See state for a description of the states and whether they are set by the tool or by the administrator. Clicking the buttons at the top will take you to specific views or perform some action. download a csv file of the currently filtered events. Note only the displayed events will be downloaded, so if there are multiple pages of events, some may be missing. 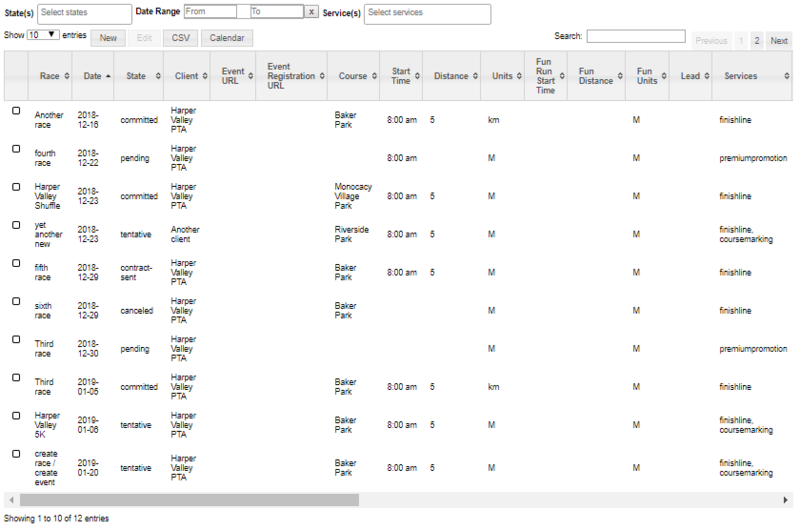 The top row of controls provides a way to filter the table display down to only show the events which are in a particular State, within a Date Range, or which has contracted for specific Services. The Create Event view is one way a race entry is created in the tool. Generally, this is used when a request is received for a new race. See Post Event Processing for details on how existing races are automatically “renewed” for the following year. Notice the State field. The State may be updated automatically by the tool or the admin can update it through the administrative interface. See state for a description of the states and whether they are set by the tool or by the administrator. When selecting Race, Course, or Client, a search box is displayed. You can start typing to find these items if they were previously stored. If a new race, course, or client is needed, click on the <new> entry and the Create Race view, Create Course view, or Create Client view, respectively, will be displayed so the item can be created. The Edit Event view can be used to update the specifics about the race, and to generate a contract. Click Update to update any changed fields in the event. Click Update and Send Contract button to generate the contract and send the Contract email to the race director (Contact email), treasurer, and raceservices. The event state is automatically set to contract-sent. The Resend Contract button is only active if contact has been sent. If in contract-sent state, Contract email will be resent. If in committed state, Agreement Accepted email will be resent. If the event needs to be deleted, click Delete. You will be asked for confirmation before the event is deleted. Note another option is to change the event state to canceled. The contract email is sent to give the race director access to the agreement. The race director may view the agreement, download the agreement and accept the agreement directly from this email. When the Update and Send Contract button is clicked from the Edit Event view, this email will be generated automatically. The email will be something like the following. Note this is configured in the system and can be changed by a superadmin. To confirm your date and lock it in on the FSRC schedule, you need to accept the Race Support Agreement. Click to view or download your Race Support Agreement for <Event> on <Date>. If you need any changes please reply to this email. If everything looks OK, please click the ACCEPT AGREEMENT button and follow the directions. Your invoice should arrive soon after you accept the agreement, but the payment isn’t due until a few days before the race. In order to get your listing on our website calendar, we provide the ability for the race director to manage the listing. That way, you can customize it as you see fit. The link to get started is: https://steeplechasers.org/events/community/add. We’ll add the race to our email promotion around <Date minus 3 months>. Please send along this year’s artwork and registration link when you have it. When race director clicks ACCEPT AGREEMENT, the link takes them to the Accept Agreement view. The Agreement Accepted email is sent when the race director accepts the agreement. This contains the same information as was displayed in the browser view after accepting. Thank you for contracting with FSRC for race support services for <Event> on <Date>. The following notes were captured when you signed your agreement. You will be hearing from us about five days prior to your event for final coordination on our finish line services. Please watch for your premium promotion to start about three months prior to your event. To receive these, please subscribe to our mailings at http://eepurl.com/bMW_Wf, and be sure to check the Frederick Area Featured Races option. If you have any questions or changes, please contact raceservices@steeplechasers.org. Before the event, an email is sent to assure proper coordination. If the race director contracted for finishline and/or for coursemarking, [5 days] prior to the race, the Pre Event Coordination email is sent. Note this is an automated email, so it’s possible you have already coordinated on this. If so, please ignore. <Event> is coming up on <Date> and we wanted to make sure we have all our ducks in a row. <FSRC Lead> will be managing your race on race day, and can be contacted at <FSRC Lead email> <FSRC Lead phone number>. Please let us know how many runners you expect, so that we can make sure we have the right number of volunteers to support the race. This should be sent as a reply/all to this email. We plan to be there 30 minutes prior to your start time of <Start time> to get the finish line set up. We plan to be there 90 minutes prior to your start time of <Start time> to get the course marked. Some folks will be arriving 30 minutes prior to your start time to get the finish line set up. Please take the time to review the Event Agreement and let us know as soon as possible if anything has changed, at raceservices@steeplechasers.org. After the event, a couple of automated tasks take place. This processing happens [5 days] after the event. Race is automatically “renewed” meaning a renewed-pending event is created the following year, on the same date, depending on the date rule specified for this race. See Date Rules view for more information. In this case, “same date” means the Nth day of week in the month, e.g., if the race was the 3rd Saturday this year, it will be “penciled in” for the 3rd Saturday next year. Note if the date rule for the race is not set, the system creates one automatically, based on nth day of week in month. The Post Event email is sent several days after the event completes. This email is tailored based on the contracted services and solicits input through a post event survey. Thank you so much for using FSRC for race support services for <Event> on <Date>. If you’d like FSRC to post your results to the Results page of our website, please send these to results@steeplechasers.org. We recommend that you use our race results template for formatting your results file. We have penciled you in for next year on <“renew” Date>. Please let us know as soon as possible if you can confirm you’ll be staging your event again next year, or if you’re sure you won’t be. And we’d love to hear how well you think we performed. Please take a very short survey at <survey link>. Please don’t forget to send email addresses of your participants to communication@steeplechasers.org. These folks will be included in our mailings about Frederick area local races. The Post Event email reminder is sent 120 days before an expected event which has not been confirmed. This email is similar to Post Event email. The event agreement will be similar to the following. Note this is configured in the system and can be changed by a superadmin. When viewing, this will be a google doc published view, and when downloading this will be a pdf document. You have requested race support services from Frederick Steeplechasers Running Club for your event. This is to confirm that we have scheduled the race support services as detailed on the following agreement. Premium Promotion: Provide spreadsheet file of your participants’ email addresses from the previous year (if available) , and then provide the current list at the conclusion of the race. Please include a statement in your race waiver as follows: I understand that I may receive emails about this race and other races promoted by the Frederick Steeplechasers Running Club. Course Support: Aid stations and Course Marshals at key locations along the route are recommended and are the responsibility of the race organizers. Timing and scoring, including generation of a list of award winners, posting of ordered bib pull-tags with finish times at the race site, and delivery of bib pull-tags at the conclusion of the event. Note: FSRC does not tally final race results beyond the award winners. Race Directors are expected to use the delivered bib pull-tags to generate race results. Your race will be included in twice-monthly email blasts to the FSRC-maintained list of area race participants, starting three months prior to your race date. Results: Your race results will be published on the FSRC website, if desired. Email results to results@steeplechasers.org. Suggested format can be found on the Race Support Services page of the FSRC website. FSRC finish line, timing and course marking services apply only to the competitive portion of the event. Walks or “fun runs” associated with the event are not part of this agreement and are the sole responsibility of the event organizer. Exceptions are required to alter the normal rules for allowing races. Normally races are allowed on weekends and not allowed on weekdays. So the first Monday of September (Labor Day) is an example of an exception because we will allow races on that day. To create a new exception, click on New from the Event Exceptions view. To edit an exception, click on Edit. Choose or create a date rule which describes the exception. See Date Rules view. available for a rule that overrides dates which are normally unavailable, and unavailable to override dates which are normally available. For items which need to be carried from year to year (e.g., races, exceptions) a date rule can be created to describe how to carry over the item. 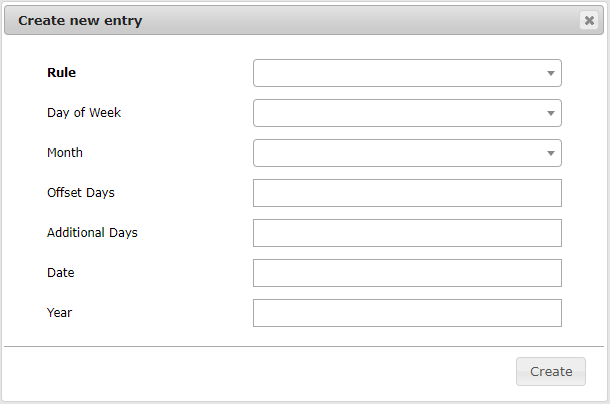 To create a new date rule, click on New from the Date Rules view. To edit an date rule, click on Edit. For a rule which only applies for a particular year, the year can be specified here. This view provides a table of all the sponsorships in the database. The admin can create a new sponsorship, or select an sponsorship for various operations. The top row of controls provides a way to filter the table display down to only show the events which are in a particular race year, for a particular race, which are in one or more states, or are at one or more sponsor levels. Setting race year will be “sticky” when navigating in the same browser tab, and setting race will be “sticky” when navigating within this tab or to other tabs. 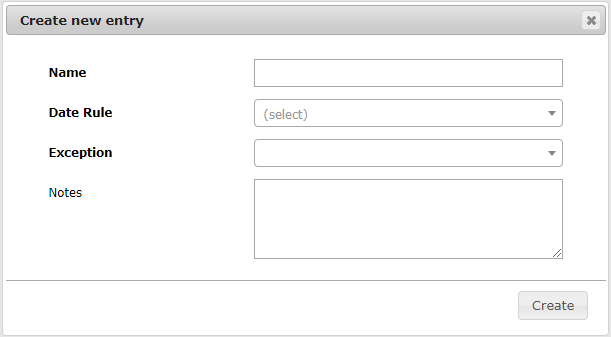 The Create Sponsorship view is one way a sponsorship entry is created in the tool. Generally, this is used when a new sponsor (client) is being solicited. See Post Sponsorship Processing for details on how existing sponsorships are automatically “renewed” for the following year. When selecting Client, a search box is displayed. You can start typing to find the sponsor client if they were previously stored. If a new sponsor client is needed, click on the <new> entry and the Create Client view will be displayed so the sponsor can be created. The Edit Sponsorship view can be used to update the specifics about the sponsorship, and to generate a agreement. Click Update to update any changed fields in the sponsorship. Click Send Agreement button to generate the agreement and send the to the sponsor client’s contact email, treasurer, and races. The event state is automatically set to committed. The Resend Agreement button is only active if agreement has been sent. The agreement email will be resent. If the sponsorship needs to be deleted, click Delete. You will be asked for confirmation before the sponsorship is deleted. Note a better option is to change the sponsorship state to canceled. After the signature race associated with a sponsorship, an automated task take place. This processing happens [5 days] after the race. Sponsorship is automatically “renewed” meaning a renewed-pending sponsorship is created for the following year. 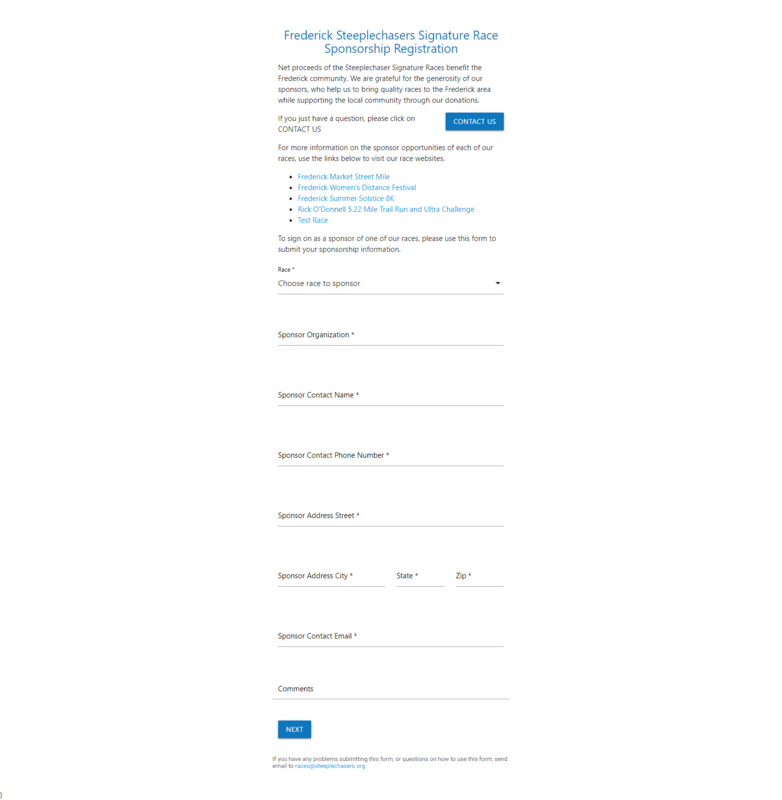 The sponsor client can indicate their desire to sponsor a signature race using the Sponsor Query Form. When a sponsor client fills out the Sponsor Query Form, the contents of the form are saved in the Sponsor Query Log.